I've made this amazing cake several times, but never posted the recipe before - I did a copycat post on it, but now it's time to save this in my own archives, too. See, I never want to lose it - it's a really great recipe, and it's a perfect standby when you need a heavy dessert, and not really know how many people you'll have to serve. It can serve anything from 8 to 18 - all depending on greed and what else you have been serving. Start by buttering a springform pan, 20 or 24 cm in diameter. Cut out a piece of parchment paper or teflon sheet, butter this too, and place into the pan. Wrap the pan in double layers of aluminum foil, as it will be standing in a pan of water. Preheat the oven to 220°C, and bring about 2 litres of water to a boil. Beat eggs with an electric beater while heating until they are slightly warm to the touch. Remove from heat and beat very vigorously for at least five minutes - the egg mixture should become very pale and fluffy. Mix the eggs and the chocolate carefully, until you see no more streaks. Pour into the prepared pan. Place pan on a large rimmed cookie sheet and pour the hot water into the sheet so it reaches about half way up the sides of the cake pan. Bake for five minutes. Cover the tin with aluminum foil and bake for ten more minutes. Remove from oven and let cool on a rack for 45 minutes. Wrap in plastic and place in fridge for at least three hours or overnight, until the cake is very firm. Take it out of the fridge, and loosen the cake from the pan with the back of a knife. Open the springform mechanism and remove the sides. Invert the cake onto a plate, and gently remove the bottom of the pan and the parchment paper. Invert back onto the plate you want to serve it on. You can now place the cake in the fridge again for up to two weeks (or so I hear - it's *never* lasted more than a day here) but remove about 20 minutes before serving. It should be at room temperature, so it's soft and flavorful. Serve with a dollop of whipped cream. I had this at Annes place some time ago and I still dream about it. Its the best chocolate cake ever!! beautiful chocolate cake! i love those flourless deep flavoured, dark & delicious ones. RLB's recipes are usually very, very good. do u sift something at the cake Anne? I can see the orange-thing from the photo. I can't wait to try this cake. And if you really wanted to go overboard you could add a chocolate glaze, at least you'd die happy. 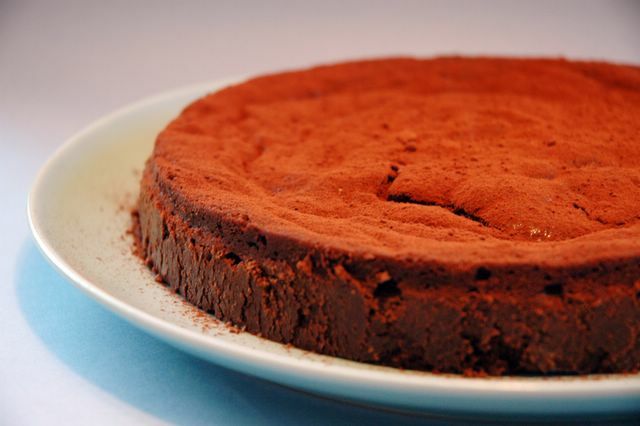 You obviously have more foresight than I, since I have lost the only paper copy I had of a brilliant chocolate truffle cake--it had only three ingredients, but looks very similar to the one in your picture. I will try this one instead (once I convert g to oz). This is one of my favorite cakes to make for others and I lost my recipe! I had discovered it in a magazine and had pulled out the page and I think it eventually got so soiled I accidently tossed it without copying it down first. THANK YOU for posting this! I've been going crazy looking for it. I just took the cake out of the oven and it is not looking cooked in the middle. Do I go by the time or by the look? Normally, I'd say always go by the look of the cake. Not all ovens are the same! This particular cake though, will firm up in the fridge. It's not half as good when it's overcooked. Still, it can't be runny either, so if it looks very wobbly, leave it for a few more minutes. Thank you, Anne. I cooked it a little to long and would do it a little less next time. It was a hit. My daughter lives in Lund Sweden and we are visiting this summer. i look forward to surprising her with some of your traditional Swedish recipes while we are there! I really enjoy your blog. i dont know what i did wrong, but this didnt work at all for me. the outside was cooked nicely, but the inside was very runny. i cooked it for a little longer to try to firm it up a little more, but it didnt work. tasted very nice as a thick yummy chocolate sauce over ice cream. will have to give it another attempt, and hopefully will work. Oh, that is strange! And too bad! I've never had any problems with this, so I hope it works out better next time! This cake is so amazing! Thanks a lot for posting this recipe. I baked it for my friend's brithday last week and everything worked perfectly fine. Hej Anne, jag skulle ju göra denna nu idag, men nu blir jag fundersam till vilkenmörk choklad man ska använda. vilken använder du? funkar det med marabous som bara har 44% choklad? Anna - det går finfint att göra med Marabous mörka. Smaken varierar beroende på chokladsort förstås, men jag gillar Marabous. ... glömde ju halva kommentaren - jag använder nog oftare Chocovics mörka som jag köper på Martin Ohlsson, men det är en smaksak. what happens if i take it out of the frisge many hours before? :) I am trying to find a recipe for a cake, which i could take with me to friends place! Liga - it might be a little soft and melty if it's too warm. It's really much like a chocolate truffle in texture. Can you keep it in a cooler, perhaps?